Size of this preview: 431 × 600 pixels. Other resolutions: 172 × 240 pixels | 4,982 × 6,933 pixels. 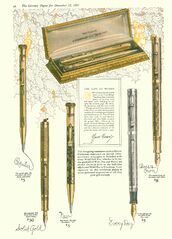 Scansione di una pubblicità Eversharp datata 1925-12-12. Pubblicata su: The Literary Digest. Data visibile direttamente. Pubblicizza una serie di penne Wahl Engine Turned in varie lavorazioni (Diamond, Wave e Dart) e matite meccaniche Eversharp. Pagina sinistra. Ritoccata dall'autore per una migliore nitidezza. 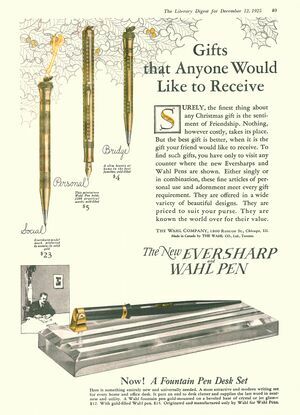 Scanning of advertising from Eversharp dated 1925-12-12. Published on: The Literary Digest. Date directly visible. 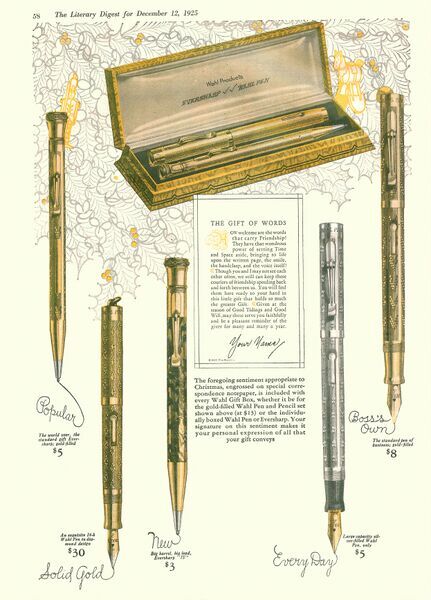 Advertising for a series of Wahl Engine Turned pens in differente patterns (Diamond, Wave and Dart) and Eversharp pencils. Left page. Retouched by the author for a better sharpness. This page was last edited on 11 May 2017, at 23:55.